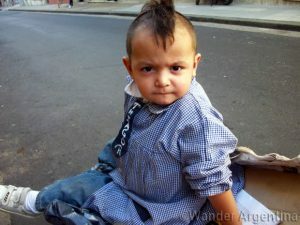 Two-year old Thiago Rosa, who can only maintain a tough face for a second before giggling, rides in a shopping cart in San Telmo. His parents, Louis and Liliana have been together 16 years. The family lives in a tent and collects cardboard to recycle for cash.